A change is afoot boys and girls…….. 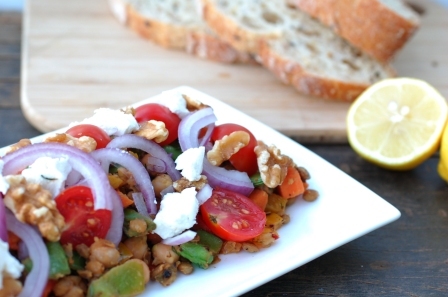 In the meantime, I give you this scrumptiously satisfying lentil salad. This salad will not do your taxes. It’s not going to fill in and mind your kids when that babysitter cancels at the last minute. But it will make a seriously yummy and healthy meal. And it will purge you of all your Easter chocolate-related debauchery. Who says one can’t have looks and brains all at once? Serves 3-4 for lunch or 4-6 as a side salad. In a large bowl, soak the lentils in at least twice the amount of water for at least 6 hours or overnight. Drain and rinse them and place them in a saucepan (hold on to the bowl as you’ll be needing it) with at least twice the amount of water and 1/2 tsp salt. Boil for 15-20 min or until cooked through (but not mushy!). If using diced pumpkin or sweet potato, toss these in a drizzle of olive oil and a generous pinch of salt, and spread out on a baking tray. Place in the oven until just cooked through (20 mins for sweet potato, 10-15 mins for pumpkin). At the same time, place walnuts on a baking tray in the oven for 8-10 mins or until slightly browned. Remove and allow to cool. In a large non-stick frypan, dry roast the cumin and coriander seeds until fragrant. Powder in a mortar or pestle or a spice grinder. In the same frypan, heat 1 tbsp olive oil and add powdered cumin and coriander seeds. Allow to sizzle for a minute or so, then add chilli and garlic. 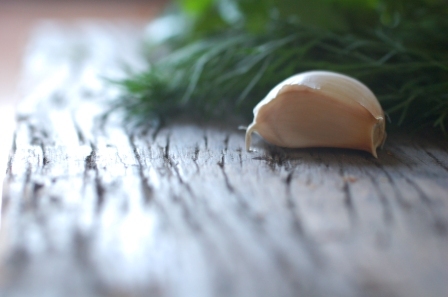 When garlic is browned, add onion and other vegetables (apart from pumpkin, sweet potato and tomatoes). Fry over medium heat for 3-5 mins until the vegetables are slightly browned but still crisp. In a small bowl or clean, empty jar, mix together the dressing ingredients until the salt has dissolved as much as possible. Now it all comes together! In the same large bowl that you used to soak the lentils, toss together the lentils, cherry tomatoes, saucepan mixture, sweet potato or pumpkin (if using), chick peas, dill and dressing. Taste and add more salt if needed. 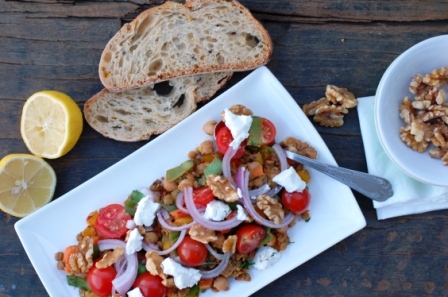 Serve warm topped with walnuts and chunks of goats cheese. If you are dill-averse, fresh coriander works quite well. Use tinned lentils if you must- but know this, when it comes to lentils, freshly cooked ones are waaaayyyy better. Oh this looks all kinds of summery light awesomeness! 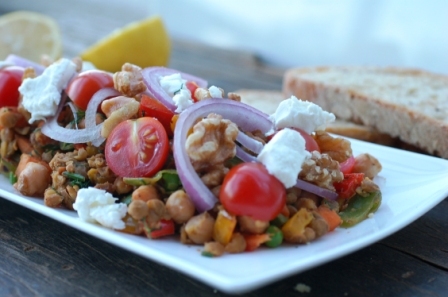 I should try it.. Maybe with local chickpeas, or rajma! Thank you! And thanks so much for stopping by.